Hello! I'm back with another Halloween design to share with you. I'm determined to make the rest of my October posts (with the exception of one coming soon) Halloween themed. It's one of my favourite times of the year for fun nail art. 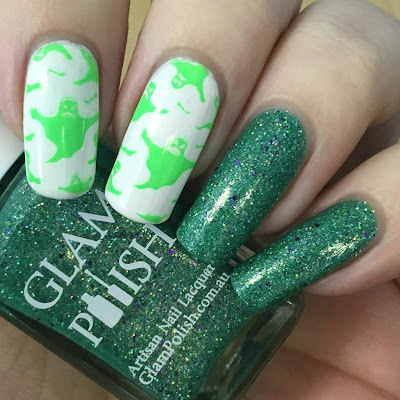 Today's mani features some brightly stamped ghosts alongside Glam Polish 'Frankenslime 2015.' Read on for more info! I painted my pointer and middle fingers white (Barry M 'Matt White'), and my ring and pinky with Glam Polish 'Frankenslime 2015' - a blue-toned green crelly with purple and green microglitter. I think there's also some holo in there somewhere! It applies really easily, and is opaque in two coats. It does dry slight textured so I would recommend a good topcoat. Below is two coats and topcoat. For my stamping, I used MoYou London Festive plate 15. The ghost pattern on the bottom right corner immediately caught my eye. Although to be honest, I love all of the images on this plate. I will eventually get around to using them all! I stamped over the white base on my pointer and middle fingers using Esmaltes Da Kelly neon green stamping polish 'Bruce', and my Born Pretty Store clear stamper. I let it dry for a few minutes before sealing everything in with topcoat. What do you think? They're super cute grumpy ghosts! I'm loving the neon green stamping polish, and will definitely be using in future designs. I also really like the mix of green and purple in 'Frankenslime 2015'. 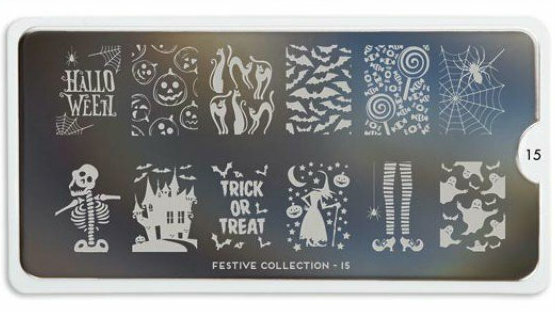 Although it's a Halloween polish, I think you could easily get away with it at other times during the year - probably not paired with ghosts though! Both 'Frankenslime 2015' and 'Bruce' were bought for me by my boyfriend from Rainbow Connection. Unfortunately this was quite some time ago so 'Frankenslime 2015' is now unavailable, but you can still find 'Bruce' here. I love that Glam!! Beautiful shade of green. I love the ghosts! That green stamps so well! I love this mani! The Glam is fabulous and that green stamps beautifully. 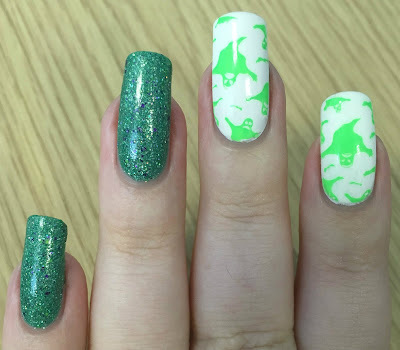 This mani is fab for Halloween!